Tom Hardy stuns playing both of the notorious Kray twins in this fact-based thriller. 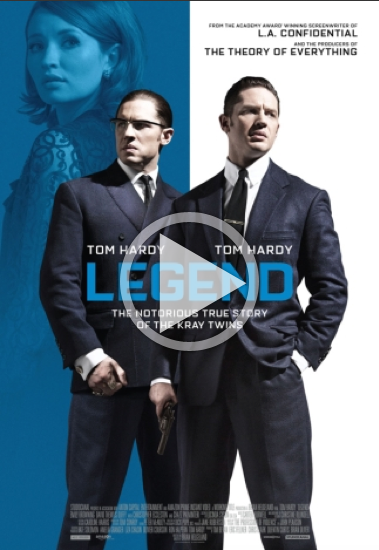 Tom Hardy stuns playing both of the notorious Kray twins in this fact-based thriller. Identical twins Ronald and Reginald Kray (both played by Tom Hardy) have established a fearsomely violent criminal empire in 1960s London. Although both brothers exert control through brute force, Reggie struggles to contain the psychotic tendencies of his sibling, Ronnie. This dramatic period thriller takes a closer look at the Krays' infamous reign of terror, exploring how they became established as two of Britain's most feared criminals. Following his role in this summer's runaway hit Mad Max: Fury Road, mercurial British star Tom Hardy delivers a remarkable dual performance as both Ronnie and Reggie, suggesting their subtle differences through careful body language. It further cements Hardy's reputation as one of the UK's greatest actors. Behind the camera is L.A. Confidential scriptwriter Brian Helgeland, and the excellent supporting cast includes Emily Browning, Taron Egerton, Christopher Eccleston, Colin Morgan and Chazz Palminteri.